Our contemporary designs are made to fit in, freshen up and make the most of your home. Shop with us online and in our wide network of shops and you can easily live the stylish life you love for less than you think. Our expert team of buyers ensure were one step ahead of sourcing what youre searching for. They continually scan the homeware horizon, soaking up the latest styles. From indoor and outdoor furniture to storage solutions and soft furnishings, you can kit out a room or just add those on-trend touches. But the best bit about SOURCED comes after youve found the product you want at a price you can afford. Because every penny of profit goes to provide incredible hospice and neurological care. So instead of supporting shareholders on the high street, you can support our patients with SOURCED. 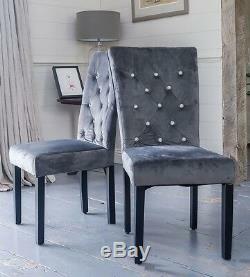 Pair of Grey Velvet Chairs with Rhinestone. 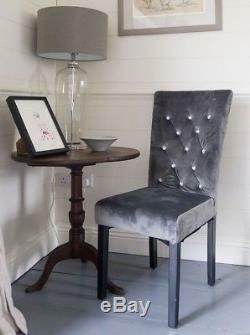 Our Contemporary upholstered high back grey velvet dining chairs will add sparkle to your home with their glamorous rhinestone diamante backrest. These chairs are perfect for your dining room but would look equally as good as an occasional chair in a bedroom or dressing room. Dimensions - W49 x D64 x H102 cms Height from Floor to top of cushion - 47 cms Weight 9 KGS Material Velvet, Legs Black Rubber wood Some assembly required (legs need to be attached), please note the legs/nuts and bolts plus instructions are stored in a zipped compartment under the seat for transit purposes. About Us Welcome to SOURCED, a range of brand new home and gifts exclusive to Sue Ryder. Our expert team of buyers ensure we're one-step ahead of sourcing what you're searching for. With indoor and outdoor furniture to storage solutions, soft furnishings and special gifts, you can kit out a room or just add those on-trend touches. But the best bit about SOURCED comes after you've found the product you want at a price you can afford. Because when you choose to shop with us over other big businesses, every penny of profit goes to provide incredible hospice and neurological care, supporting people at the most difficult times of their lives. If we cannot despatch within this time we will let you know right away, the date the goods can be delivered. We regret that for larger items we are unable to deliver to destinations outside the United Kingdom (and Channel Islands) or PO Box addresses. We will always aim to resolve any issues promptly and efficiently. We will use reasonable commercial efforts to load faithful representations of the product offered but please refer to the description of the product alongside the image to confirm colour, condition and dimensions. Sizes are usually given as height, width and depth, in that order. Some of our products are made from natural materials, where some normal colour variations may also occur. All goods are offered for sale subject to availability. The item "Pair of Grey Velvet Rhinestone Diamante Upholstered Dining Chairs" is in sale since Wednesday, July 11, 2018. This item is in the category "Home, Furniture & DIY\Furniture\Chairs".